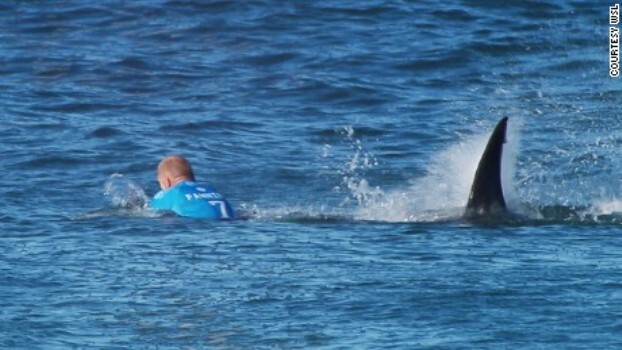 A surfing competition in South Africa was canceled Sunday after championship surfer Mick Fanning escaped a shark attack in the opening minutes of the final heat. Organizers of the J-Bay Open, the sixth stop on the 2015 Samsung Galaxy World Surf League Championship Tour, canceled the remainder of the competition after clearing the waters. Video of the incident appears to show two sharks circling the three-time World Surf League champion. The Water Safety Team pulled Fanning and fellow competitor Julian Wilson out of the waters to safety. Fanning escaped with a severed leash on his surfboard. He told World Surf League TV that he “punched” the shark “in the back” to scare it away. “I had this feeling that something was behind (me), and all of a sudden I felt like I started getting pulled underwater. And then the thing came up and I was on my board and it was right there,” he said. The incident rattled the surfing community, which breathed a collective sigh of relief over news of the rescues. In an interview after the incident, fellow surfer Wilson struggled to maintain composure as he recalled watching Manning get knocked off his board.